To finish their season off before the summer break, the Norwich Citadel Band (Bandmaster Richard Woodrow) likes to make a visit to a local seaside corps to lead worship and give outdoor concerts. This year, they were invited back to Great Yarmouth, the largest seaside resort in Norfolk. Arriving by car on a beautiful day, the members of the band were offered tea, coffee and cold drinks before Band Sergeant Graeme Hall and the band led morning worship at the Salvation Army hall in the town. Following lunch, the corps had arranged for the band to march along the promenade to the bandstand. A great witness was made at a resort bustling with those on holiday—on the beach, strolling along the promenade, riding in the horse-drawn landaus and working slot machines and other amusements along the seafront. The bandstand was on the green next to the Sea Life Centre on the seafront. Despite the humidity and heat of a sunny July day, the band gave a 60-minute concert, interspersed with comments from Matthew Peek and corps officer Lieutenant Ben Selfe. A nice aspect of the day was that, in addition to the band, family members who traveled with the band were able to enjoy both lunch and tea at the corps. The day concluded with an ecumenical serice in St. George’s Park. Members of the Great Yarmouth Band were invited to join with the Norwich Citadel Band in this act of worship. 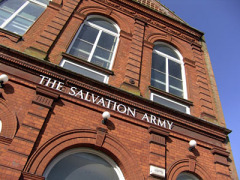 This article was posted in News and tagged Ben Selfe, Graeme Hall, Great Yarmouth, march, Matthew Peek, Norwich Citadel Band, open air, Richard Woodrow, worship on 5 November 2014 .